This post is sponsored as a part of #AppleWeek. Envy Apple provided me with apples for recipe development. As always, all opinions are my own. 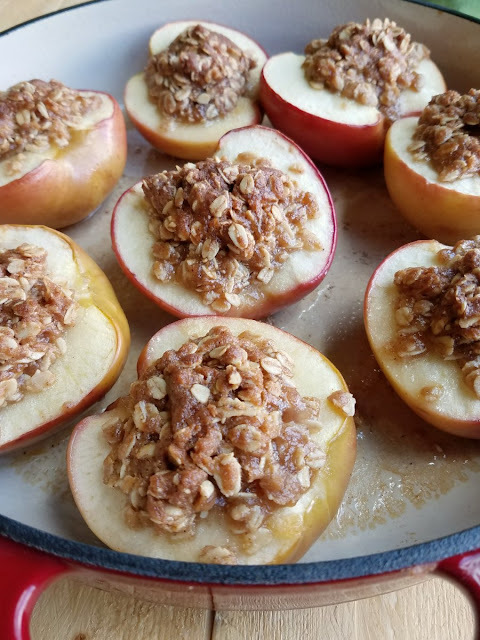 Are they a baked apple or apple crisp? These fun desserts are a little bit of both. 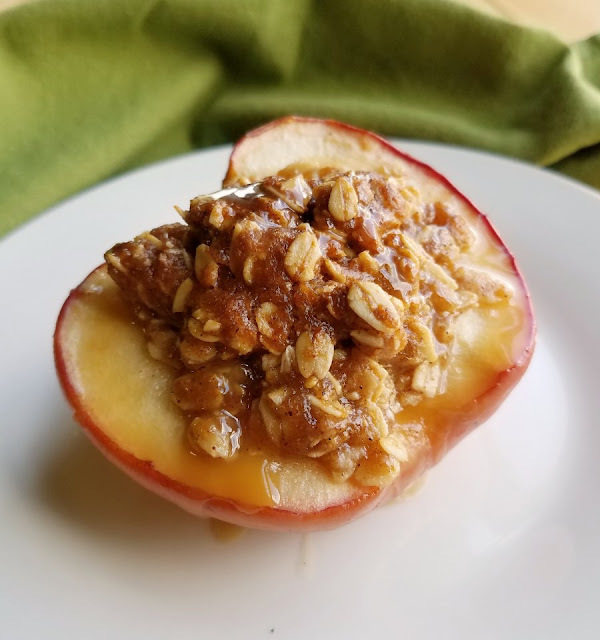 Tasty baked apples topped with crunchy brown sugar and oat topping. They are perfect individually sized treats that might just become your favorite fall dessert. Baked apples have a bit of an inside joke with my husband and his friends. For a cookout many moons ago, he picked up a bag of apples to make a treat for everyone. He carefully wrapped the apples in foil and put them over a fire. Yep. Whole wrapped apples wrapped in foil. He could have cored them and put some butter, brown sugar and cinnamon in them, but he didn't. He could have sliced them and given them a similar treatment in a skillet, but again he didn't. In all fairness, this was long before he met me. I'm sure he would have known better otherwise. To say the results were underwhelming seems to be an understatement. The guys still love to laugh about it to this day. Apparently that was just the start of a while conversation of ideas related to the apples. A conversation that may or may not have been fueled by an adult beverage or two. Either way, it is always a source of entertainment and belly laughs when it comes up. I would like to say that inspired him to perfect the art of actually making an edible baked apple, but it hasn't. So baked apples are my department and honestly I'm ok with it staying that way! 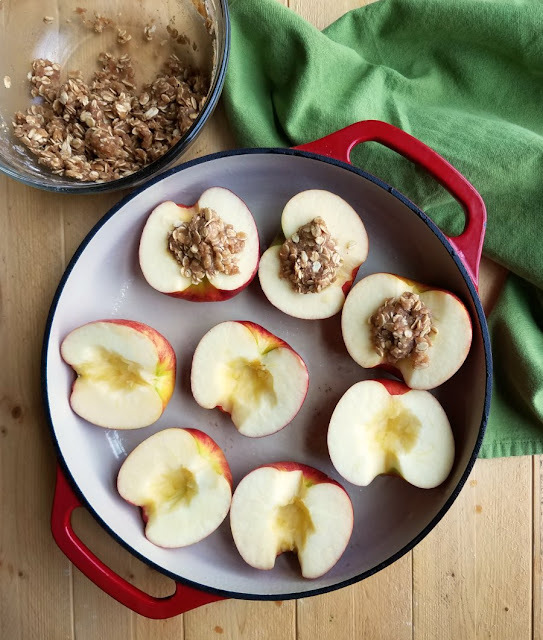 These baked apple halves are the perfect size to indulge a bit without going overboard. When I saw the lovely box of Envy Apples I got for appleweek, I knew I wanted to do something to really highlight them. So I set a few aside for recipe creation and quickly hid a few in the back of the crisper drawer. My lunchbox was quite happy I did too. Those beauties really were a highlight of lunch while they lasted! They have such a beautiful flavor, I didn't want to go crazy hiding it with other ingredients. Instead I just cut them in half, scooped out the core and stuffed them with the ingredients you'd find in a typical apple crisp. After all they are a classic for a reason. The results were amazing! The apples were fork tender, but not mushy. The topping was sweet and golden and crunchy. They were fabulous on their own, but a scoop of vanilla ice cream and a drizzle of caramel sauce certainly didn't hurt them. Little Dude is always an excellent helper in the kitchen. He put together the topping and helped the apple scraps find their way to the compost bin. Then he helped fill the apples. We both anxiously waited for the timer to buzz. The house smelled so good and we could not wait to sink our teeth into one. They were worth the wait! My husband had been napping on the couch and rose from the dead as soon as he heard the rattle of plates. He knew he had better make his way to the table asap! We all agreed that this is definitely the proper way to bake an apple! 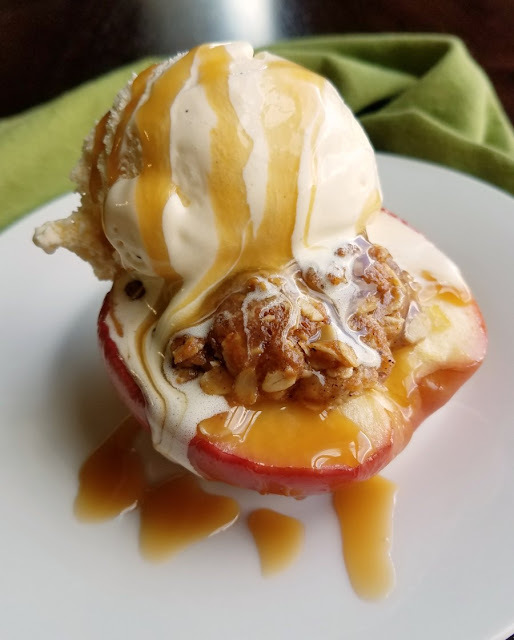 I hope you have been enjoying all the apple recipes so far this week. Which ones have been your favorites so far? 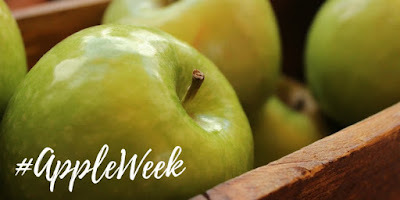 I'd love to know if you've made any #appleweek recipes you loved, from this year or years past. In a large oven proof skillet, melt butter. Pour melted butter into a medium mixing bowl and add brown sugar, flour, rolled oats, cinnamon, nutmeg and a pinch of salt. Wash apples and cut in half through the stem. Use a spoon, small knife or melon baller to remove the core. Place apples, skin side down in the skillet. It should already be greased from melting the butter. Stuff the apples with the filling mixture, pressing lightly to keep it in place. Pour the water around the apples. Cover tightly and bake at 375 F for 20 minutes. Remove the cover and bake for 30-40 minutes more or until the apples reach your desired consistency. They should be fork tender but not mushy. Serve with ice cream and a drizzle of caramel if desired. I love the idea of giving the apples a crisp topping like this, look tasty. And I can see why the story about your husband is the source of many laughs! Wow that is the perfect fall dessert and it looks so good!!! I bet it makes the house smell good too. They do smell amazing while they bake, that is for sure! Thanks, Julie! These look amazing! I can't wait to try these! They were sooo good, thanks Val! Those looks delicious Carlee! What a great way to serve the apples! They are pretty simple and oh so good! Thanks, Karen! OH, I love this idea. What a great presentation. This looks like the perfect fall dessert!!! What a fun and delish recipe! 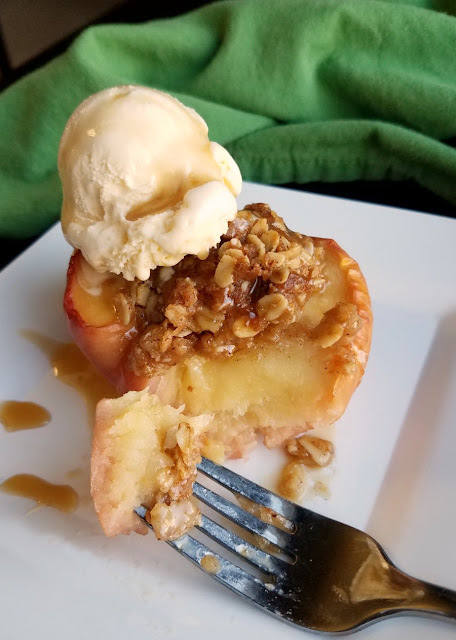 So glad you shared it at our Apple Recipes For Celebrate Blog Party! They are sooooo good <3 Thanks, Jan! 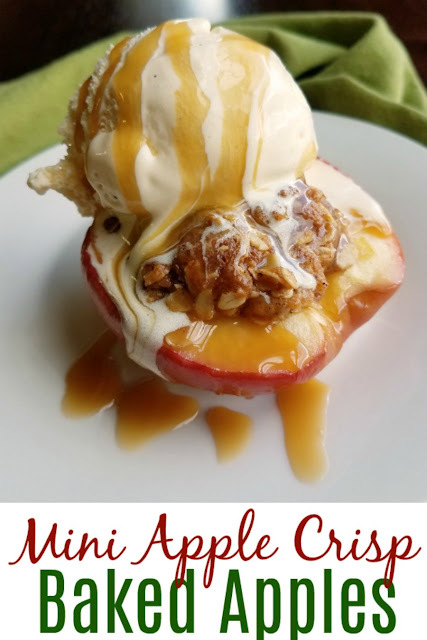 Your Mini Apple Crisp Baked Apples look fabulous! Thanks so much for sharing with us at Full Plate Thursday and have a great week! Carlee, these are lovely. And just how I like to make baked apples! Your husband's way? Not so much. :D That was hilarious! Thank you for hosting #Celebrate365. These are so adorable - and relatively healthy compared to most desserts out there! I can't wait to make some for myself! I love how this would control my portion size for me!! 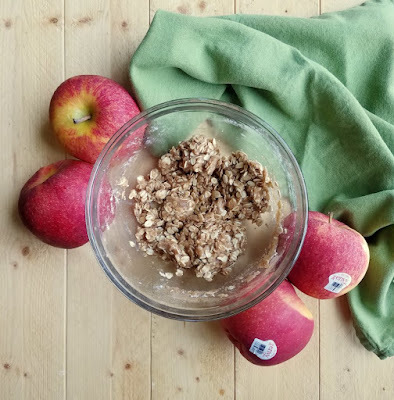 This is such a great little dessert to make this Fall! The hardest part would be not going back for a second! Easy and tasty is always a good combination! I've never had a baked apple! These look absolutely fantastic and make me question why I've not tried them. By the way... fabulous story about your husbands earlier attempts! Sounds like something my husband might have tried!! To me, this is one of those to die for recipes. Your pictures made it even more so. I am going to make these. Thank you for sharing. They are so good and fun to make and eat too. We are definitely having them a few more times before fall is over! Oh this looks heavenly, Carlee! Sign me up immediately. Thank you so much for sharing with us at the Whimsical Wednesdays Link Party! Have a great week! Come on over and I'll make them for you any time!